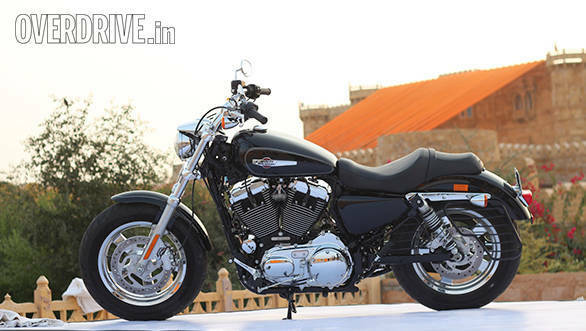 Harley-Davidson recently withdrew the SuperLow from the Indian market. That's a pretty significant move given than it was the most affordable Sportster. But the range is now back to three motorcycles with the new Harley-Davidson 1200 Custom. 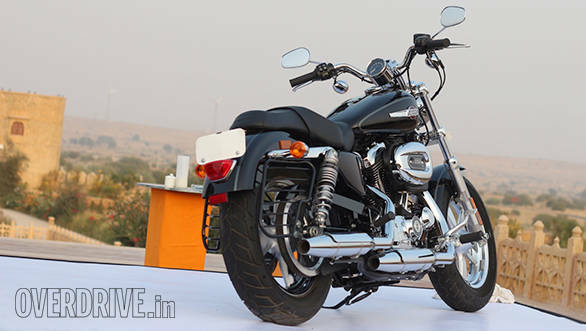 The 1200 Custom will be CKD-assembled in India at Harley-Davidson's plant in Bawal, Haryana. Priced at Rs 8.9 lakh ex-showroom Delhi, the bike arrives to sit between the Harley-Davidson Iron 883 and the Harley-Davidson Forty-Eight. I got a chance to ride it for a short stint before the sun came up outside Jaisalmer. It's 0500, an hour and a half before the first light of dawn will arrive. A powerful beam of light cuts through the thin film of morning mist. A steady rumble cuts sharply through the silence in this arid expanse. There isn't much life here, and what little there is, is asleep. But the Harley-Davidson 1200 Custom and I are feeling awake, fresh and impossibly alive. The sharp cold of a Rajasthani winter morning is just perfect to contrast with the energy and fire of the moment. My mile-wide smile is coming from how enjoyable the 1200 Custom is proving to be. Despite the name, the motorcycle is very much a regular part of the Harley-Davidson Sporster line up. This design showed up about five years ago. It's an interesting blend of elements. The wheels are chunky cast five-spoke alloys that wear chunky looking 16-inch Michelin Scorcher tyres - a 130 front and a 150 rear. The bike's front end doesn't look very raked out and the rear looks compact and tucked in as well. This makes the chrome of the 1202cc V-twin occupy a greater visual volume in the design. It also makes the 1200 Custom look stubby. I like that. I'm less clear on whether or not to like the metal piece atop the headlight that H-D calls the eyebrow. But overall, I find the compact, purposeful stance appealing. The engine itself is a familiar unit. The 1202cc Evolution V-twin makes 96Nm at 3,500rpm and it also powers the Forty-Eight. It's matched to a five-speed transmission and naturally, it has belt final drive. It is a good motor. Riding into the darkness, I loved how torquey and urgent the bike feels. Opening the throttle produces instant acceleration. The bike sounds at peace at almost any speed below 140kmph. I pushed it past 170kmph for a short stint and it still sounds reasonably composed and vibration isn't unbearable either. I'd commented earlier to someone that the Forty-Eight was surprisingly nice on the highway except for the laughable tank range, short stints-only seat and the immense tyres that cause it to wander gently over less than perfect roads. The 1200 Custom literally attacks these very things. It's got a 17-litre tank and Harley claims just over 20kmpl (US cycle). So a good highway run should allow you 200-250km between fills. Harley makes special mention of the two-up seat. I only rode the 1200 for half an hour but it definitely felt very nice. Finally, despite the odd 26-inch size and their appearance, the Michelins are grippy and unknown, slightly sandy corners were dispatched by the Harley-Davidson without any drama. In fact, I thoroughly enjoyed the handling of the 1200. The bike is responsive and on it. It isn't especially quick but it doesn't have to be. The brakes similarly, felt linear with well-judged initial bite. Harley currently isn't offering ABS on the 1200 Custom yet. The sense of poise and control is probably down to the new suspension. The 1200 Custom uses a cartridge style front fork and a pre-load adjustable twin shock rear setup. Harley includes a preload spanner in the toolkit under the seat. What I also noted and will be looking closer at is the ride quality. The bike felt firm for the most part and not uncomfortable. But unfamiliar roads make it hard to judge exactly. I think the 1200 Custom will prove a little bit stiffer than our incredible roads demand. The 1200 Custom, in keeping with its compact, tightly-packed nature, uses a set of pulled-back bars that feel natural to reach to. The forward-set pegs take just a moment to sink in and after that the 1200 feels very natural. I imagine that shorter riders might need a bit of fine tuning but it felt just right for me. The Harley-Davidson 1200 Custom will be assembled from CKD kits just like the Iron 883 and the Forty-Eight, the other two Sportsters. 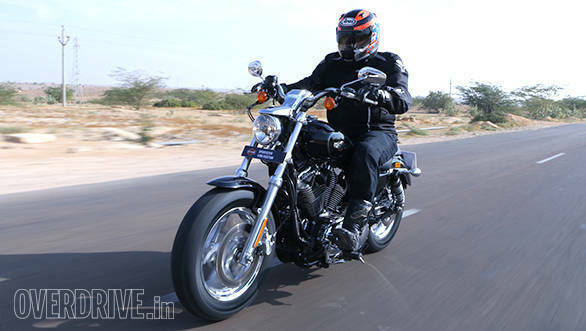 Harley has priced the motorcycle at Rs 8.9 lakh ex-showroom Delhi. 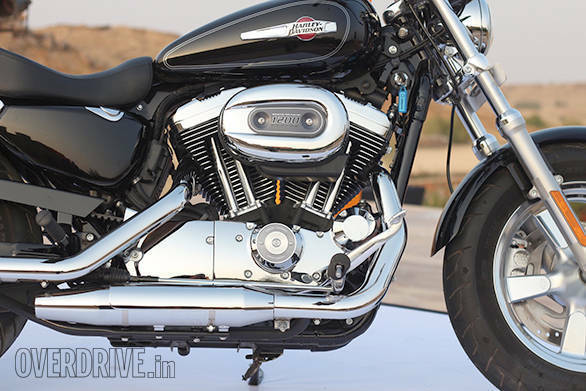 This makes it about Rs 1.5 lakh more than the Iron 883 and Rs 50,000 less than the Forty-Eight. 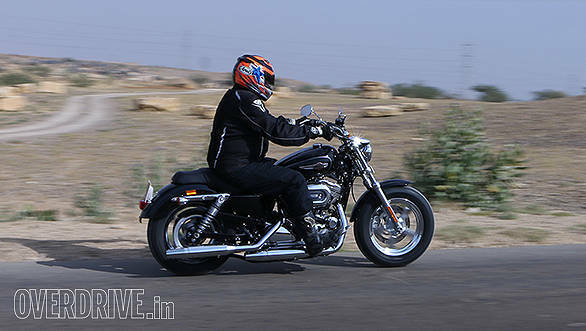 As an aside, Harley-Davidson recently stopped selling its cheapest Sportster, the SuperLow in India. The new 1200 Custom seems to be a conscious attempt at creating more spec between the Harley-Davidson Street 750 and the bottom of the Sporsters. The gap is now Rs 2.5 lakh, which suggests there is a model or two headed for this space in the future. Bookings for the 1200 Custom in India begin today and delivery time frames will vary from city to city. As you can tell, I enjoyed riding the Harley-Davidson 1200 Custom a lot. It was a short stint but the motorcycle showed off its torque, comfort, and responsive nature. The Forty-Eight looks better than the 1200 Custom, I think but there's no doubt that once we road test the 1200 Custom, it will emerge as the best Sportster you can buy in India.